Osteoarthritis, also known as degenerative joint disease and degenerative arthritis, is the most common form of arthritis. It involves the breakdown of cartilage in the joints and is primarily found in older adults. Symptoms include aching, soreness, pain, bony enlargements in the center of a joint, and joint swelling. 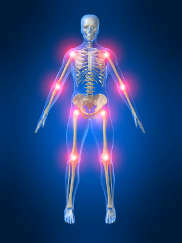 Osteoarthritis is most commonly experienced in weight bearing joints such as the knees and hips. It is typically the result of aging, but can be intensified by other factors such as heredity, injury, obesity, joint overuse, and stress. While there is no cure for Osteoarthritis, there are helpful treatments that and lessen the pain, increase mobility, and enhance the individual’s quality of life. The type of treatment an Osteoarthritis patient receives will vary depending on a myriad of factors. If you suspect you are experiencing Osteoarthritis, it is critical that you discuss your symptoms and treatment options with your personal physician to ensure you are getting the right treatment for your particular needs. Physical therapy and exercise. A licensed physical therapist can advise you on specific muscle strengthening exercises that will help support ligaments and tendons and help alleviate pain. Supportive devices. Supportive devices increase mobility, prevent falls, and are great for pain relief. A hinged knee brace, can be used to stabilize ligaments and tendons which will significantly decrease pain, while devices like crutches or canes can lessen the direct stress on joints. When selecting a device, make sure it is lightweight, comfortable, and easy to adjust for a precise fit. Medication (oral or injected). Your doctor may prescribe you pain-relieving and/or anti-inflammatory medications which can help with Osteoarthritis management. Weight Control. Keeping your weight in a healthy range will reduce the stress on your joints. Hot or cold therapy. Hot or cold compresses can be administered to reduce pain and swelling. Removal of fluid. If excess fluid surrounds the joints, your physician may choose to drain that fluid manually in order to alleviate pressure on the joint. Alternative treatments. Some medical research concludes that glucosamine and chondrotin can rebuild cartilage, especially in the knee. There are also other (currently unproven) supplements that are also associated with Osteoarthritis treatment. Likewise, some people swear that acupuncture and bio-electric therapy alleviates pain, though there have not yet been any conclusive studies to support these claims. Surgery. If less invasive treatments prove ineffective, your doctor may recommend corrective surgery. About the Author: MMAR Medical Group Inc. is a leading diabetic shoe supplier. They also offer socks for diabetics as well as a full line of orthotic insoles.